Gorilla Black Small Diameter Tuner lug nuts are a perfect factory replacement. 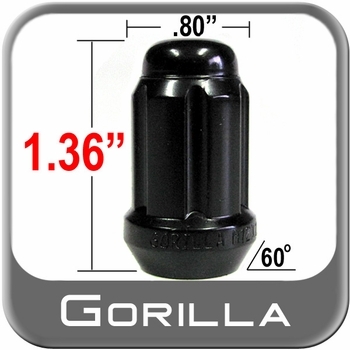 Gorilla Black Small Diameter Tuner lug nuts are made of heat treated hardened steel. Quick installation and removal is a given with a new set of Gorilla Black Small Diameter Tuner lug nuts. Enhance your exterior with new Gorilla Black Small Diameter Tuner lug nuts for that finished look.